Since the first run at the previous Copenhagen Fashion Trade Show went so smoothly, indoo.rs was invited to equip the second annual show this summer with accurate real-time Indoor Navigation as well. The goal was to help visitors of the show master the maze of exhibitors and instantly find their favorite brands within the fashion jungle. The exhibition space was a 10,000sqm indoor venue at Copenhagen’s Meat Packing District, filled with more than 300 different Scandinavian brands alongside some likeminded brands from outside the region, which attracted thousands of fashion lovers and traders. Our two most stylish engineers, who’d fit in perfectly with the other fashion enthusiasts, went there to SLAM the show. They installed 350 Bluetooth LE Beacons, took recordings inside two buildings of Øksnehallen and finally ran the SLAM Engine over it for the most accurate finish. Our Indoor Navigation solution was integrated into the mobile “Revolver Fashion Trade Show” app, which was developed by our partner STRØM WORKS. As Carl Emil S. Bregnhoi, Client Services Director at STRØM, pointed out in one of our previous blogposts, this time around, tickets for the show were exclusively available via app. Hence, every visitor had the Revolver Fashion Trade Show app installed on their mobile prior to the event, allowing for the best conditions to have them interact with the event and location. On a side note, the app hit the top 10 of app downloads on the Danish iOS App store in the category “Lifestyle Apps”. 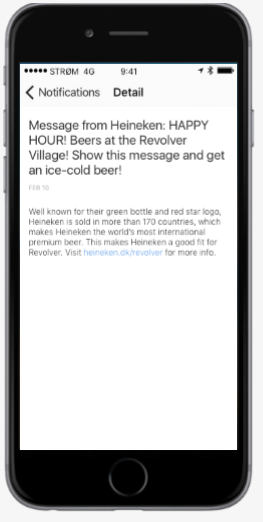 Moreover, visitors could receive push notifications on their phone, which informed them about special offers at the event. The Copenhagen International Fashion Trade Show is part of Copenhagen Fashion Week and held twice a year, in February and August, at the exhibition space of Revolver Village. The show is organized by Revolver Aps, an order-platform designed to bring the latest Scandinavian style fashion trends not only to Nordic but also to international buyers. Revolver Fashion Trade Show SS/17 Powered by STRØM from STRØM WORKS on Vimeo.